Florida has already had one storm named in the Sarasota region this year, so that means that hurricane season has arrived. It is important to update your family’s hurricane emergency plan so that everyone can remain safe. Your family should know what to do when a hurricane is arriving in the region, including listening to the emergency radio announcements. An important part of an emergency plan is having plenty of nonperishable food and bottled drinking water available. You should also have a supply of batteries and flashlights. Make sure that your vehicle has enough fuel so that you can leave the area before any strong winds arrive, but you should not attempt to travel after the hurricane is in the area. In addition to a hurricane plan, you should have hurricane protection items for your home, including roll-on adhesive window film or durable shutters to cover the windows. During a hurricane, windows can break easily without hurricane protection devices, and this can lead to injuries from flying glass or extensive damage to your home. Contact Hurricane Safe Products today at 941-351-7700 to learn more about our hurricane protection products. Hurricane season will be here soon. It is time to prepare now for what that time of year can bring. You need to have protection for your home or business so that you can keep storm damage to a minimum. One way to protect your property is by installing products from Hurricane Safe Products. We have hurricane screens available that can be put up and taken down as needed. They are easy to install and store. Accordion shutters and rolling shutters keep larger areas of glass safe from wind blown debris. Hurricane impact windows and doors protect from hurled objects, and they provide energy efficiency for your home. These are just a few of the protection items available from Hurricane Safe Products. If you live in or near the Sarasosta, FL area, contact us for more information about how our products can help you prepare now for the upcoming hurricane season. Hurricane season in Florida is right around the corner and there are a multitude of hurricane safe products on the market that can offer maximum hurricane protection to keep you and your family safe and secure. Now is the time to consider installing some Green Tek rolling shutters that provide maximum security for windows while also lowering monthly heating and cooling bills or clear Lexan panels that offer an affordable option for hurricane protection and are easy to install. Accordion-style shutters made of heavy-duty aluminum are another option for safety. Clear flat panels offer invisible hurricane protection while keeping out the heat from the blazing Florida sun. These are available in custom sizes and shapes to fit any size windows in apartments and homes across the state. Hurricane screens offer protection from hurricane winds, are easy to store, and extremely affordable but many people opt for hurricane windows and doors to keep their families safe during hurricane season. Ultra-shade screens are another option for protection and extra benefits include keeping out insects and sun while gaining more privacy. The 2018 hurricane season will be upon us here in Florida soon. Now is the time to make your home safer from the potential wind impacts of hurricanes and other storms. At Hurricane Safe Products, we have a number of ways to help make your home more secure in the bad weather. One of the best means of hurricane protection is to install hurricane impact windows on your home. These windows protect against flying debris, and they help insulate your home which saves on energy costs. Hurricane screens can be placed over existing windows. This product is easy to put up and take down as needed. Hurricane shutters are available to pull down over doorways and large areas of glass. These are just a few of the hurricane protection items available from Hurricane Safe Products. If you live in the Sarasota area, contact us at Hurricane Safe Products for more information. When you live in Florida, it is important to have a hurricane protection plan in place for your home or business. In some cases, government authorities will tell you to leave the region when a hurricane is approaching, but you should have hurricane protection products on a building to protect it from high winds and torrential rains. If you do remain in a building during a hurricane, then having hurricane protection devices can prevent injuries from flying debris. Hurricane Safe Products located in Sarasota sells and installs a variety of hurricane protection devices. A salesperson can inspect your commercial or residential property to provide advice concerning the types of hurricane protection devices required for a particular building. Some of the items that we sell include durable clear or tinted window film and a variety of shutters. We can also install hurricane protection exterior doors on businesses or homes. While you are preparing your hurricane safety plan, make sure to call us for an evaluation of your home or business so that you can have the proper type of hurricane protection devices installed. Ask anyone who lives in an area that is prone to hurricanes and they will tell you that the key to hurricane protection for your home is planning ahead. There are many things you can do to equip your home with the correct protection. Here are just a few of the products that can help, all of which are offered by www.hurricanesafeproducts.com. * Rolling shutters: Not only do these high-quality shutters provide maximum protection from storms but they also can help to lower your energy bills. * Clear panels: Available in many sizes and styles, these panels offer affordable protection that is easy to install. * Screens and shutters: Made of high quality materials, these can provide privacy, shade, and hurricane protection at a reasonable price. * Garage doors and braces: These doors are specifically rated for hurricane protection, and the braces provide an extra layer of security. These are a few examples of the many high quality products available to help keep your home and loved ones safe in the event of a hurricane. Why not check them out for yourself? There may not be a hurricane looming towards your home right now, but for those of us who live in coastal areas, we know it’s just a matter of time. Hurricanes are seasonal weather events that bring devastating destruction to both human life and property. Although insurance can protect the monetary cost of your home, investing in hurricane protection can help protect priceless items in your home that money can’t replace. Beyond giving you peace of mind, installing hurricane protection to your home may save you money. Ordering hurricane protection materials in the off-season allows you to shop around for deals when demand is low, insuring that you get the best prices on materials. Working on your home when it’s not hurricane season also means you can perform the installation work at your own pace, either doing it yourself or by hiring a contractor. Finally, if you meet with your home insurance agent, he or she may be able to provide financial incentives for you to upgrade your home’s protection. It’s in everyone’s best interest to be prepared for these natural disasters before they come, and the time to invest in hurricane protection is before there’s one at your doorstep. Hurricane season will soon be here once again. It’s time to start thinking about protecting your home from the damage that can occur due to hurricane force winds. At Hurricane Safe Products, we have several options to help you for the 2018 storm season and beyond. Hurricane screens are an affordable option to protect windows large and small. They protect against significant winds, and they’re easy to store when not in use. Impact windows are manufactured with a special type of glass that provides protection from flying objects. These windows are also very energy efficient, so they help you save money on utility bills. Finally, hurricane rated garage doors are available. These doors are braced to withstand wind damage and objects being hurled against them. To learn more about our outstanding line of hurricane protection products for your home, contact us at Hurricane Safe Products in Sarasota, Florida. his past year, the Sarasota area experienced the power of a hurricane. Objects are easily blown around in hurricane force winds, and these blowing objects can be hurled through a home’s windows causing extensive damage. Hurricane shutters are a convenient way to provide hurricane protection for your home. Hurricane Safe Products offers a line of hurricane shutters by Greentek. These rolling shutters benefit your home in two ways. They can be used during times when it is not stormy to keep the heat of the Sun out of your home. During a hurricane, they can be rolled down for protection. The shutters are made from a polymer that provides protection against flying objects. 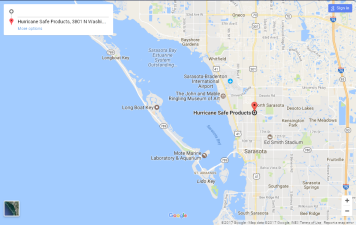 If you live in Sarasota or the surrounding area, contact Hurricane Safe Products. Learn about hurricane shutters and other products available to keep your home secure. It is very important to protect your home from the flying debris caused by hurricane force winds. One way to protect windows and doors in a hurricane is by using hurricane protection shutters. These shutters come in a variety of sizes. They are made of a flexible material, so they will fit around bay windows and odd shaped openings. They also work well for car ports and garage doors. At Hurricane Safe Products, our hurricane shutters have passed the Florida Building Code missile test. In fact, our screens provided twice the protection required by the code. The UltraScreen model with multi-ply construction and stainless steel brackets can help your home withstand Category 3 winds easily. Visit us at www.hurricanesafeproducts.com for more information and see the variety of protection items we offer.